For art-lovers! This Valentine's Day. We're having a very special workshop on Thursday, February 14th and I wanted to make a special blog post because I know it's coming up soon! We are hosting a romantic art-making night for those of you guys that want to do something fun, but a little different! 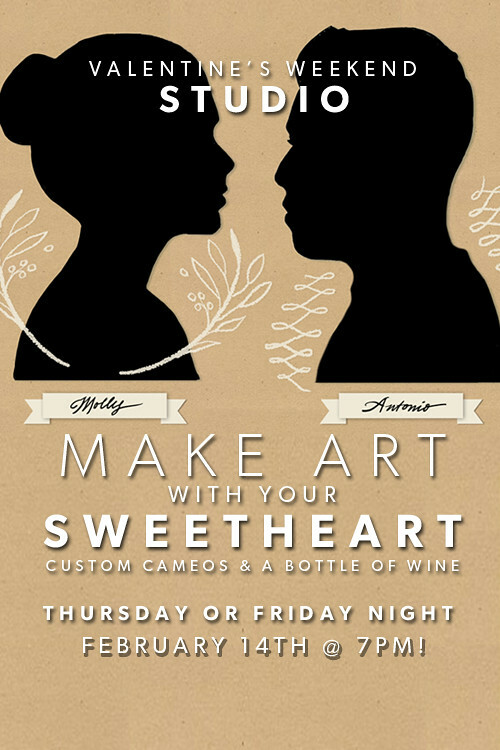 Join us that night for a bottle of wine and make cameos of you and your special friend! Here are all of the details -- we have 5 spots left, so grab one if you're interested in joining us! The whole experience is about 1.5 hours, and costs $60 for the pair. We'll have everything you need, so just pre-register and come on over! We'll help get you set up to make your own silhouettes, decorate and frame them, all while listening to great music and sharing your own bottle of wine.